Thank you, and a very cheerful Shambhala Day to all of you. Cheerful Shambhala Day! [All: “Cheerful Shambhala Day!”] That’s better. [Laughter] And a very cheerful Shambhala Day to all those of you who are joining us. I was actually wondering, as you might wonder if you were me, what is Shambhala Day? [Laughs; laughter] Why do we come together on this new day, this fresh-start day? Shambhala Day represents the notion that we — as a community, as a sangha, as an organization, as a multigenerational culture — raise our group energy, we raise our group lungta. As much as it is an occasion for all of us individually, Shambhala Day is very much a communal, social, raising of lungta. This is very important for us because many of us obviously work hard and life goes by quickly; it’s easy just to lose track of the days, months, and years. All of a sudden, the belly is either bigger or smaller or the hair has changed colors. So many things are occurring — it’s important that we take this astrological moment when, according to the lunar system, the new year is beginning. We take a moment to reflect on this precious existence, this experience of life that we are all going through. We have gone through challenges, but our whole makeup as human beings is geared toward living. And there is so much that can overwhelm us. As the geopolitical situation is increasingly more intense, we all begin to wonder about the goodness of being human. We all begin to wonder about the goodness of society. So this moment is our attempt as Shambhala — and globally, it’s not the only attempt — to come together and to make life meaningful and valuable. It takes a community to do that. We need to support each other and we need to wake ourselves up, so that we do not just look down. Shambhala Day is about looking up, by the way. You can always check your lungta barometer by noticing where you meet people visually. If you find yourself looking a lot at their feet, you know where that’s going! But if you raise your gaze to the heart or the head, it’s getting higher. Can we as a community raise our lungta? We gather, we practice, in order to do that. But even at an atomic, genetic level, we need to feel the purpose of living. We need to do that daily. Meditation teaches us how to be moment to moment. But together, astrologically, we need to do that annually. And we need to reset our orientation. Like a ship sailing in the vast ocean, it is very easy to lose direction. We need to know how to orient ourselves. Are these principles valuable to us? Are they what we would like to affect us? So today is the moment when we do that, and we do it in a cheerful way. For whatever reason, my father decided to use the word cheerful instead of happy. If you know him, it makes perfect sense, but I am also okay with happy, by the way. [Laughter] Considering everything, it’s being nitpicky. So either happy or cheerful — that’s a transmission, because in this day, there is a tendency to be depressed. There’s a tendency to be hard, to be not optimistic, and we can see why. But this is an opportunity for us to see how our life can be worth living. And one of the most important things right now is how we do that. We need to galvanize not only our own energy, but also the community energy. In the last few years, you have heard me talk about the notion of the Shambhala principle of basic goodness. The great Druk Sakyong, Chogyam Trungpa Rinpoche, the Dorje Dradul of Mukpo, traveled to the West to bring this message. When we reflect on why such a great being would do this, it becomes more and more self-evident that it is time for us personally and globally to look at this fundamental message of human nature. Out of this comes the notion of how we can create good society. That is the notion of vision — as we say in Tibetan, lha, “what is above.” It is associated with the head, the eyes, and looking out. It’s having an attitude and a direction. We have now also had time to reflect personally to see if we believe in or feel basic goodness. That has been a personal and a communal contemplation. I believe that now, as we enter into this Year of the Horse — which naturally correlates with the notion of windhorse, energy, action — that this is very much a year of doing, accomplishing. It is very much a year of the nyen, as we say in Tibetan. Nyen is very much connected with the torso. It is the mountain and hills aspect of geography. For all of us who are in various positions and roles, it has to do with leadership. In Shambhala, we are at a point where we have a sense of vision and we have personally connected, but we need to join those together. We need the nyen. We need that heart and the chest. We need to know how to move forward in that way. For me, what we have been asked to do is a daunting task. 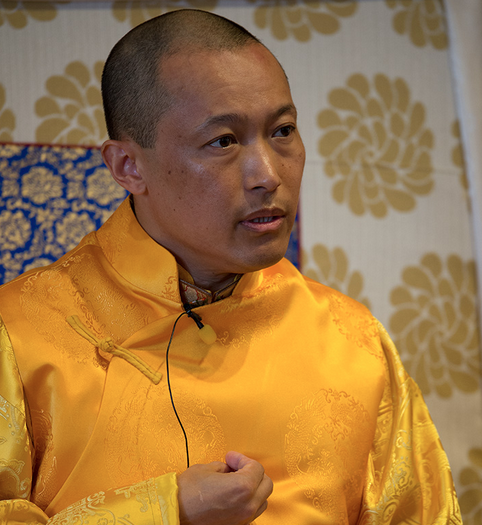 The more I reflect on the actual meaning of the Shambhala teachings — what we have inherited and what are we doing — I realize that it’s not so much that we are simply trying to meditate our way out of the problem — even though many of us have tried, [laughter] and keep trying, by the way. Rather, the Shambhala teachings are talking about the fabric and nature of creating a paradigm shift. They are actually looking at how society functions — the ethics by which society functions and how people value each other. In this light, we have been given the task of becoming architects of a new civilization. We are actually being asked to contribute to how the world is going to be. Do we want it to be based upon aggression? Do we want it to be based on condescension? What are the value systems that we want to uphold? This task is very challenging for us. Sometimes in our Shambhala centers, it is hard enough to just do the programming. We are overwhelmed. Personally, we may only have time to practice, amidst everything that’s going on. However, by reflecting myself and by talking with a lot of you, I know that we are deeply, viscerally, emotionally, and maybe subliminally concerned about the direction society is taking. What are the methods by which we are going to participate? Are we just going to abstain and hope it gets better? Meditation itself is an indication of the power of the mind and heart. We are in a situation where we are trying to empower the human being. We call it “raising lungta.” We call it “planting the Ashe.” We call it “having the sun of basic goodness.” As my father would like to say, “we believe humanity, the human being, is naturally awake.” And that wakefulness has power and energy. We feel that. Sometimes that’s why we can’t sleep at night, that’s why we get frustrated — because it’s powerful. Not only is it powerful, it is intelligent. And it’s not just us as Shambhalians who have this wakefulness. Everyone has it. Here we are, living on this planet, leading our lives, and we are all contributing to this social soup. With our attitude, either we are participating or we are abstaining. What I’m wearing is called a chuba. It’s a Tibetan dress. So in Tibet they say, “Hitch up your chuba!” It’s kind of like, “Roll up your sleeves.” [Laughter] This is very much a hitch-up-your-chuba-and-roll-up-your-sleeves kind of a year, depending on where you come from, and your order of selection. [Laughs; laughter] What that means is that we do not necessarily need to join an NGO. Of course, if we have the choice, we can help desperate situations around the world. But here it means embodying these principles and having the confidence to expand. One of the key ways that it really occurs is by creating a culture of kindness. We have been focusing on kindness for a while. I have been giving the same speech for twenty years [laughter], and some of you are definitely old enough to remember. But kindness doesn’t mean a schmaltzy community. Kindness indicates an intelligent community. When you are kind, it means you are observant of another. And as soon as you see another and you are kind, you notice what? How you are similar. As soon as human beings realize they are similar, what happens? The tendency to help occurs. And in the Shambhala vernacular, what is the tendency to help? It’s called success. An unkind community is an unintelligent community where we simply notice the faults, the deficiencies. Then we abstain, and soon we become isolated. So we need to become a kind community — not just a bunch of individuals together trying to be nice, but people who have the lungta, the vulnerability, and the bravery to actually extend. The moment you notice somebody and extend kindness, that’s brave. When that happens between two people, a culture of kindness is instantly created. So today we are celebrating, food, meditation, and conversation. You can do less meditation today [laughter], and more food and more conversation. We have the power to create culture, which doesn’t necessarily require massive numbers of people. It occurs when one individual has discovered their inherent culture of goodness and is willing to share that. Although you can’t see it, that’s what’s happening between the aura and the energy. I’m using those words because we are in Boulder. [Laughs; laughter] You can’t see it, but there is something happening. Subliminally, that’s what my father would be calling enlightened society — that invisible connectivity that is occurring. That is culture. When we drive our cars or eat food, we are always looking for that notion of connectivity. We as human beings need each other. Our emotional connectivity validates our existence. We know more about who we are. That is a human trait. If we think the world is shrinking and are afraid to connect, what kind of a lonely place is it going to be? We see ourselves as full of many seeming deficiencies, too. Then we create a culture of separation, mistrust, fear, and animosity, which is an abstaining culture. For us here who are in a contemplative tradition, this should be a proactive culture. Not that we are forcing somebody else to think how we think, but that we are not embarrassed to engage and manifest our principles. Right now, as meditation becomes more common and popular, we have a little more leeway to actually feel less self-conscious about these principles, and to manifest them. Right now, we are at the cusp, or the beginning, of finding many ways for these principles and teachings to manifest — in the workplace, education, and so forth. Can we project the energy of this horse? Traditionally, a horse represents many principles. It’s the notion of exertion, movement, success, and victory. For us, it is also the notion of inherent human dignity. We can actually connect with our dignity and connect with one another. When human beings take their seat as human beings — and even when a dog takes its seat as a dog, or a horse takes its seat as a horse — that intimidates us because they are being who they are. So when we are who we are as humans and have dignity, the elements line up. We are not afraid of nature. We can be part of nature. We can be part of the elements. In our tradition, connecting in that way is called drala, magic, or inherent wakeful energy. Today — Shambhala Day — is very much the notion of magic. We are literally here, and somehow amongst all this there is amazing heart. When we think about it and reflect on it from that point of view, it is truly a miracle. It’s important that we allow ourselves to honor that. I very much look forward to working with the Kalapa Council and all of you who are center directors and leaders. Leadership training is very important this year. I also feel like we have begun a very important transition. We have the vision, and there is so much happening. At the same time, we need to increase our understanding of finances. I’m extremely happy that we are already moving in this way in terms of the Unified Giving Model, and we have so much to do. Gathering people and having a community is naturally the element of richness and wealth. Inherently, it is part of the notion of dignity. It’s important that we are not afraid to think that we, as a community, can be successful. Leadership can move forward in this way. So I encourage all of you to find out how you can participate and contribute. Effort is an essential component not only of what will keep this together but of how we will move forward. In that light, I want to encourage the wonderfulness of our multigenerational community. It keeps getting older, by the way. Those of you who are young – it’s important that you feel you can train and be leaders and participants in this community. Now is the time to step up and participate. So I send my love and greetings. Those who are in Europe, I tried to speak as slowly as I could, so excuse me if I was too quick. Those of you who are in the evening, please enjoy the rest of your festivities. Those of you who are very early in the morning, please enjoy the beginning of your festivities. I look forward to the teachings and the programming that we have scheduled. We are continuing the effort of going out, doing more festivals and continuing that energy. We also have wonderful retreats planned. So those of you who have the time and opportunity, please join. In particular, please maintain that sense of bond that we have.